Lonesome's story is one that parallels the issues faced by children of all ages. 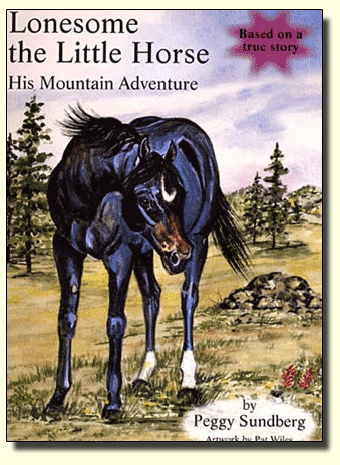 When I met Lonesome through my horse rescue activities, he had been roaming on open range in the mountains. With no proper food available, his diet included a lot of loco weed which grows wild in Colorado. We learned later that he had been bullied by larger horses at his previous home. Lonesome recovered steadily once he joined us at the Coyote Moon Ranch. I introduced him to my goat, Daisy, and they became fast friends. In the book you will find awesome artwork by Pat Wiles, an actual photo of Lonesome and Daisy, along with the details of the real-life story for the adults. Lonesome delivers the message clearly while setting an example to re-enforce it. His experiences translate easily from horse to human, opening the door for discussion with children. Now available in Perfect Bound Softcover. Checks and money orders can also be sent to the address om the contact page. Lonesome is also available at Amazon.com and Barnes & Noble as well as other retail outlets.